The report, LEED in Motion: Residential, examines how LEED-certified homes, apartments and condominium buildings are transforming the building industry and the lives of dwellers across the country and the globe. The number of LEED-certified green housing units more than doubled between 2011 and 2012, to 150,000 units worldwide, the report says. 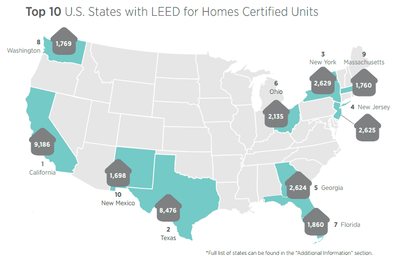 Nearly 150,000 LEED-certified homes exist worldwide, with most still concentrated in the U.S. 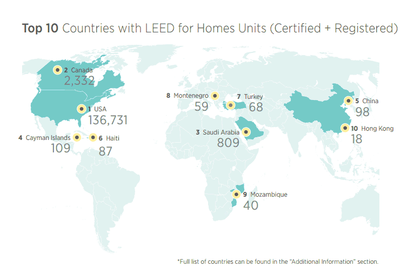 The U.S., Canada and Saudi Arabia are the top three countries for LEED for Homes certified units. The report also details the U.S. states with the most LEED-certified homes. California tops that list, followed by New York and Texas. LEED for Homes was launched in 2008, two years after the first home was certified under a pilot program. 84 percent promoted durability and high performance of the building enclosure and its components and systems through third-party verification. California tops the list for LEED-certified homes in the United States. “LEED has been successful in transforming commercial buildings over the past two decades,” Rick Fedrizzi, president, CEO and founding chairman of USGBC, said in the report. “But our collective green building success will reach astronomical proportions when we revolutionize homes everywhere…because the global sustainability revolution starts at home, where our habits are formed. ..."
Green labeled homes also sell at higher prices, USGBC has said. A green label adds an average 9 percent price premium according to a separate study that analyzed 1.6 million homes sold in California between 2007 and 2012. Recognition of the top 10 countries for LEED and a profile of Gulnar Homes in Turkey, developers of a LEED Gold home in Istanbul. The report is available as a free download on the USGBC website.